The venerable head of the hareidi yeshiva world, Rav Elyashiv, passed away in Jerusalem at the age of 102. Putting up notice of Rabbi's passing. The great Torah Sage, head of the worldwide Lithuanian-hareidi yeshiva world, and leading Torah luminary of this generation, Rav Yosef Shalom ben Chaya Musha Elyashiv, passed away at Shaarei Tzedek Hospital in Jerusalem, Wednesday, at the age of 102. 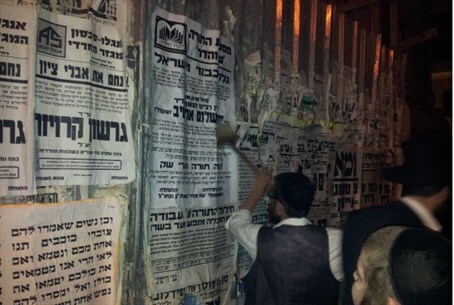 Rav Elyashiv's funeral left his home in Hanan Street in Me'ah Shearim that night, at 10:00 p.m. The pious and righteous sage did not want eulogies said at his funeral, so psalms and prayers were recited by speakers instead. The procession is to pass through the following streets: Shivtei Yisrael, Smuel HaNAvi, Nar Ilan, Yirmiyahu, Weizmann and Highway 1, through Saharov Junction to the Har Hamenuchot cemetery at Givat Shaul where Rav Elyashiv's wife is buried - this was his wish, despite the fact that a burial plot was reserved for him at the Mount of Olives next to renowned Torah luminaries who preceded him. Close to 300,000 mourners, both black and knitted kippah wearers, accompanied the procession. Roads leading to Jerusalem were totally jammed, many closed by police, and cars were parked on the side of the highways as their drivers attempted to run to the funeral by foot. Emergency medical services, some providing water to participants, were stationed all along the route. Rav Elyashiv was hospitalized for pneumonia the night of February 5 and remained in the hospital due to other complications. His condition improved for several months - the doctors attending him called it nothing short of a miracle, when he was able to communicate some of the time and listen to Torah thoughts of his visitors - but today's deterioration in his condition began because of low and unstable blood pressure. Doctors were called to his bedside and the rabbi was anaesthetized and respirated as doctors tried unsuccessfully to stabilize his condition. His family was at his side in the ICU and was able to repeat the Viduy prayer (the prayer of confession and affirmation of belief said at a Jewish person's deathbed) read from the from Ma'avar Yabok holy book several times before the rabbi's soul departed the earth. Near his beside stood the Gaon Rav Shmuel Auerbach, the head of the LIthuanian hareidi education system (Chinuch Atzmai) Rav Avraham Leizerson, the hospital's halakhic arbiter Rav Weiss and the hospital's senior physicians. The eighth floor of Shaarei Tzedek hospital was closed and barricaded to prevent the worried students who rushed to the scene from blocking the area, with Border Police on call to keep order, but the sound of loud prayers and psalms could be heard throughout the hospital as they, and many renowned rabbinic figures, prayed for a miracle. All hareidi schools and yeshivas stopped the afternoon study session (seder) in Israel to pray. Israel's Radio Kol Hai broadcast prayers recited live by Rav Eliyahu Schlesinger of Gilo and the Kabbalist Sage Rav Addes. Following the rabbi's passing, the head of Shaarei Tzedek hospital, Dr. Yonatan Halevy, gave a summary of the period of the rabbi's hospitalization and told how the entire hospital marvelled at his unusual powers of recovery during the last few months. His voice breaking, one of the attending physicians, Dr. Silverstone said: "There is no way to make up this loss. May his prayers for us at G-d's Throne be heard, we need them so much." Rabbi Yosef Shalom Elyashiv was born in 1910 in Lithuania to Rabbi Avraham Erener and Chaya Musha, daughter of the kabbalist Rabbi Shlomo Elyashiv. His parents were married for 17 years before his birth and he was an ony child. In 1922, the family moved to Israel and changed their name to Elyashiv at the advice of the famed Chafetz Chaim, settling in the hareidi Jerusalem neighborhood of Meah Shearim. The young scholar never attended a regular yeshiva framework, but was recognized as a genius in Talmud study at a young age. When after serving as rabbi of Ramle for a short time, Rabbi Elyashiv was appointed a Rabbinic Court judge (dayan), Rabbi Yitzchak Herzog, Israel's Chief Rabbi, excused him from rabbinical and rabbinic court examinations, saying that they were unnecessary for someone of his caliber. Rabbi Elyashiv married the daughter of Rabbi Arye Levine (called "father of the prisoners" as he visited and helped the Lehi fighters incarcerated and later hanged by the British during the Mandate period). Rabbi Tzvi Yehuda Kook, later head of the Merkaz HaRav Yeshiva was the matchmaker and his father, the first Chief Rabbi of Israel and founder of the Merkaz HaRav Yeshiva (called Yeshiva Merkazit at the time) , Rabbi Avraham Yitzchak HaCohen Kook, performed the wedding. Rabbi Elyashiv and his wife Shayna Chana z"l had 12 children, one of whom, Rivka, was killed in an artillery barrage during Israel's War of Independence. One of his daughters married Rav Chaim Kanievsky, another a son of Rav Shlomo Zalman Auerbach. His home in Jerusalem was constantly filled with those seeking halakhic advice and although he did not write any Torah works, his students wrote down his words for him, while he studied and lectured ceaselessly. Rav Shach, the worldwide hareidi Torah leader, asked him to attend the founding of the Degel HaTorah hareidi party and Rav Elyashiv took over the leadership of the Lithuanian hareidi world after Rav Shach's death. Baruch Dayan HaEmet (Blessed is G-d, Who judges in truth - words said upon hearing of a death).